KITsubs: Kamen Rider Skyrider episode 33! Kamen Rider Skyrider episode 33! The crossover free-for-all continues, as Skyrider teams up with Riderman to take down a twisted NeoShocker plot! NeoShocker's New York operative Rattagon has devised an army of drones to delivery a deadly poison to the people of Japan! Meanwhile, a young friend of Shigeru's stumbles on to Rattagon's plot and gets caught up in NeoShocker's treachery! 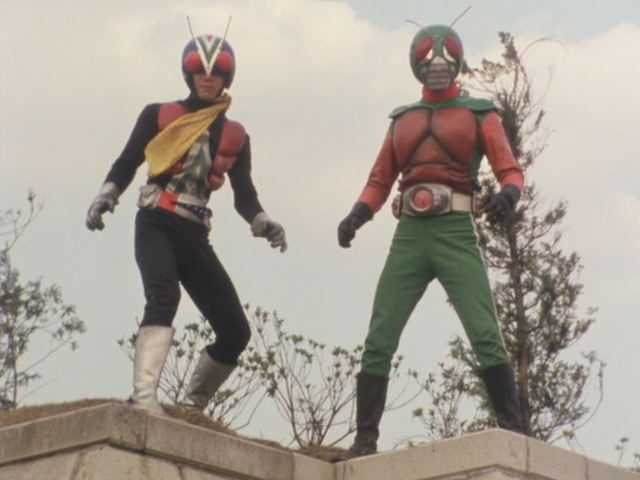 Will Skyrider and Riderman be able to stop NeoShocker's plot before the whole country is wiped out?! Come back this weekend for the next Kamen Rider Drive, and stay tuned soon for Kamen Rider episode 43! Woo! SKYRIDER! I enjoy the series so much man. Kamen Rider Drive episode 6-8! Kamen Rider Drive episode 05!